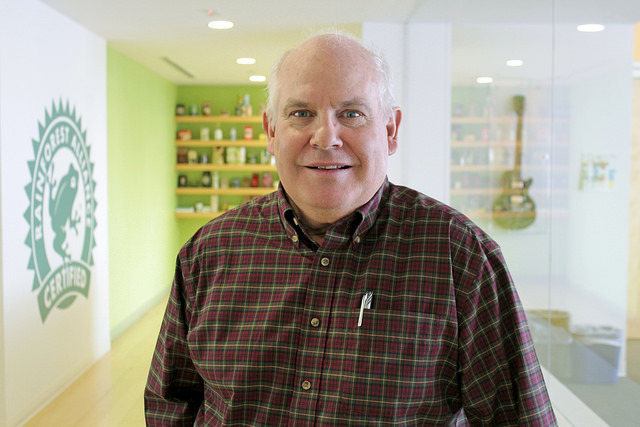 In recognition of the International Day of Forests, we invited Senior Forest Advisor Richard Donovan to reflect on his decades long career in forest protection at the Rainforest Alliance as he heads into ‘semi’ retirement. 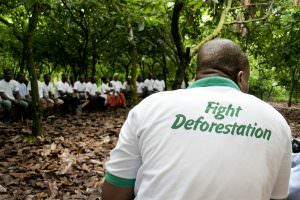 The ‘sustainable forestry legend’ talks about his early days at the Rainforest Alliance, the impact of our forestry strategy over the years, and what he sees as the four priorities for the future. It was early 1992 and I was in the Greenwich Village neighborhood of New York City at the small and very busy Bleecker Street office to explore employment with the 5-year-old Rainforest Alliance. I first got to know the Rainforest Alliance through a visit to my field project named BOSCOSA, situated on the Osa Peninsula, Costa Rica, in 1988. Chris Wille and Diane Jukofsky came down from San Jose, Costa Rica to report back to the Rainforest Alliance on the BOSCOSA project. Rather than just meeting in the office, I took them along on a muddy tramp across a river and up to the Guaymi Indigenous Reserve on the Osa and adjacent to Corcovado National Park. After a day slogging up and back from the Reserve, and great conversations, it seemed clear that the organization they both worked for wasn’t ‘just’ a rainforest campaign organization, but focused on putting in place real, tangible solutions balancing conservation and livelihoods. Tropical timber boycott campaigns were popular at the time, but the Rainforest Alliance wasn’t buying into that concept. I had already lived and worked twelve years in the tropics and was not an advocate of boycotts either. Paraphrasing from our conversations, “there are people in those forests and if somehow we don’t reconcile conservation with community livelihoods, the people, the forest and the wildlife, will all get screwed”. Fast forward to 1992. After coming home to Vermont, in northeastern US, in late 1990, I was a consultant helping some foundations and NGOs set up the embryonic Forest Stewardship Council (FSC™). Through that process I met Ivan Ussach, the first director of the Timber Project & SmartWood Program at the Rainforest Alliance, and after a few years, Ivan reached out and asked if I was interested in taking over his role. This led to my first meeting with Daniel Katz, founder of the Rainforest Alliance, and a deal was sealed. Daniel’s ‘so practical it’s radical’ approach convinced me, and he was willing to bet on my abilities to help our mission. I started April 1, 1992, when there was no Internet, Federal Express had just started, fax machines were relatively new, and Rainforest Alliance had a small office in New York and Costa Rica, where Chris and Diane would live for around 20 years. Our SmartWood forestry certification portfolio (which preceded the formal launch of FSC in late 1993) included five forests in Belize, Brazil, Honduras, Indonesia and Mexico Here we used the visionary certification model that required chain of custody certification alongside forest certification to ensure truth-in-labelling by wood processors. We had about twenty Chain of Custody certificate holders, including companies producing outdoor furniture, plywood and construction materials. This foundation for today’s Rainforest Alliance has led to continuous positive impact over the past decades. For example, in Guatemala, led by forest pioneer Jose Roman Carrera, we have worked with communities, companies and government to produce over US$100 million in value of certified forest products. The FSC system, which we helped create and continue to work with every day, has now certified over 36,000 businesses producing FSC certified products and there are now almost 200 million hectares of certified forests around the globe. FSC also has over 30 auditing firms globally, following the original models set up by Rainforest Alliance. In addition to forestry, the Rainforest Alliance is active in more than 60 countries worldwide to drive sustainable agriculture in commodities such as coffee, tea, cocoa, bananas, flowers, and oil palm. Where do we go from here? I am now working with a great team at the Rainforest Alliance on a new forestry sector strategy, in which I would prioritize four things. After tremendous growth of forestlands under the control of communities and indigenous groups across the tropics (now 20%), we are committed to working to conserve and manage those forests and creating sustainable livelihoods and enterprises, including timber products, non-timber, recreation or tourism. We are at a great moment to re-engineer commodity certification systems, such as FSC, SAS, RSPO, etc.) to make them more beneficial to certified operations of all kinds. We need leaner, but always rigorous, systems. We need to capture the use of technology, and reimagine certification, so that companies, governments and NGOs all contribute to conserving and restoring forest ecosystems, tackle deforestation, and eliminating forced labor and suboptimal working conditions. Companies, governments and NGOs make enormous commitments to forest restoration, yet lack accountability for achieving those commitments. The Rainforest Alliance role in the Accountability Framework Initiative and certification systems gives us the opportunity to work with others to help ensure on the ground, lasting change. For the first time in human history the world is more urban than rural. The Rainforest Alliance, as much as any organization, must help lead in demonstrating how forests, wildlife, agriculture and people can successfully co-exist, based on an understanding of the people who live and work on farms and forests. We should set a high bar on what constitute sustainable stewardship, and sourcing, and not be afraid to work in uncommon partnerships and alliances. Going back to what Daniel Katz set out as our guiding principle, we must continue to be “so practical we are radical” in conserving and restoring biodiversity and forests and creating sustainable livelihoods… in helping, as the new Rainforest Alliance mission states, to create world where people and nature thrive in harmony.